For those who have been enjoying the STARZ tv show Outlander, but have not yet read any of the books, or perhaps have only read the first one, today might be the day to fall off the fence, and go from being tempted to pick the novels up, to actually getting them. Why? Amazon.com has the first 7 novels on sale as eBooks for $1.99. Here’s a link directly to the page: The Outlander Series 7-Book Bundle: Outlander, Dragonfly in Amber, Voyager, Drums of Autumn, The Fiery Cross, A Breath of Snow and Ashes, An Echo in the Bone . We do not know how long this sale will last — but 7 books for the price of 1 novella is certainly a price worth considering… and in our estimation, worth letting others be aware of. This entry was posted in Novel and tagged A BREATH OF SNOW AND ASHES, AN ECHO IN THE BONE, Claire Randall, Diana Gabaldon, Dragonfly in Amber, DRUMS OF AUTUMN, Jamie Fraser, Novel, Novels, Outlander, Random House, Series, STARZ, THE FIERY CROSS, The Woman of Balnain, VOYAGER on August 3, 2015 by Kay. 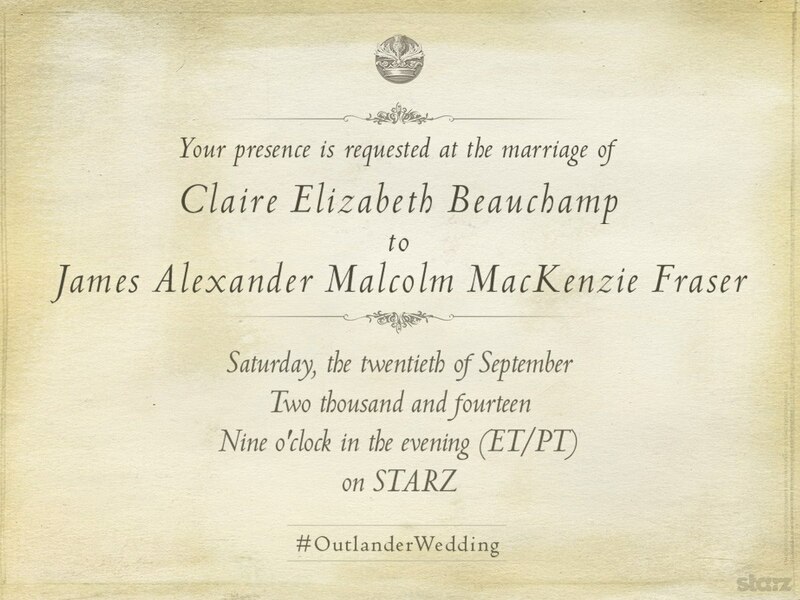 Chapters 14 and 15 of Diana Gabaldon’s Outlander cover the wedding of Claire Elizabeth Beauchamp (Caitriona Balfe) and James Alexander Malcolm MacKenzie Fraser (Sam Heughan) known to one and all by the nickname Jamie. The wedding in the book was similar in many ways to the wedding on the show, though there were a few differences, such as the show choosing to present the events out of order as the couple discusses the day they have just been through. In the book the greater difference was in the marriage of Claire and Frank Randall (Tobias Menzies) and this is a case where I was glad the show chose to make not just minor changes, but major ones. I understood why the author chose to write the book the way she did, and the emotions she was putting her character Claire through, but when I first read it, the passages struck me as a bit much. I agreed that her wedding to Jamie would undoubtedly remind her at every turn about Frank, about her desire to return to 1945, and this is a tremendous fork or turning point in her life. Is Claire giving up hope of returning to 1945? Is Claire now accepting her life in the 1700s? Is this a marriage of convenience or emotion? Is this Claire simply doing what she must to make it through another day, or week, or does this marriage to Jamie mean something more? The wedding is given an entire episode and I feel rightfully so because it means so much for Claire, and coming out of this day Claire is in a new position figuratively speaking. Not because she is Mrs. Fraser so much as because she has made a permanent move in this time-frame instead of just treading water in an effort to find her way back to Frank. That is a decision that should have emotional ramifications. Sam Hueghan shows his acting abilities quite well in several of these scenes with Claire. As she is reacting to her own thoughts and emotions in the wake of what she has done he is clearly noticing them, observing her and realizing there is something going on with this beautiful lass he has married. The nuances to both his performance, and that of Caitriona Balfe were quite nice as they took the audience on an emotional roller coaster with them. With only one more episode before a mid-season break that will take us into the new year, it will be interesting to see how much further into the novel the show carries us. My hope when they first announced the divided season was that the show would take us to Part IV of the novel before the winter break… but we shall have to wait a week to find out, especially since the commercial for this coming week appeared to show some 1945 scenes that I do not recall from the book. This entry was posted in Review, Television and tagged 1945, Angus Mhor, Annette Badland, Bear McCreary, Caitriona Balfe, Claire Beauchamp, Claire Randall, Colum MacKenzie, Diana Gabaldon, Dougal MacKenzie, Duncan Lacroix, Fan Expo, Fan Expo Canada, Fan Expo Toronto, Frank Randall, Gary Lewis, Gathering, Geillis Duncan, Graham McTavish, Grant O'Rourke, Jack Randall, Jamie Fraser, John Heffernan, Laoghaire, Lotte Verbeek, Mrs. Fitzgibbons, Murtagh Fraser, Nell Hudson, Outlander, pocket Jamie, PopArtsPlace, Ron Moore, Ronald D. Moore, Rupert MacKenzie, Sam Heughan, STARZ, Stephen Walters, The Way Out, The Woman of Balnain, Tobias Menzies, Tom Brittney on September 22, 2014 by Kay. The sixth episode of Starz Outlander, The Garrison Commander, covers more of the events in Chapters 10 through 21, again changing a lot of the story line, adding characters, and recrafting events in intriguing and fascinating ways. From the moment I first started reading the book the character Dougal MacKenzie (Graham McTavish) fascinated me. In most current Romance novels his alpha character introduction would have signaled his being a major player, and male interest for our female lead. Because I knew I was reading the book in anticipation of the television series, and at the recommendation of a friend, I had opted not to read the back cover text about the novel. As a result I entered the story blind, not knowing who was a major player in the story, and who was minor. As a result, when Claire (Caitriona Balfe) first met Dougal (Graham McTavish) I was both intrigued and curious. Who was this man, and what role would he play in Claire’s attempt to survive life in the 1700s? Dougal (Graham McTavish), as portrayed in the telvision show, is slightly different than in the book, the nuances to his character fascinate me. His loyalty to clan and country and never in question, but his motivations, and what he is seeing and how he will act on it is constantly of interest. I assumed Black Jack Randall (Tobias Menzies) would be the Garrison Commander for whom this episode was named, in part because he was the highest ranking Red Coat we were familiar with thus far. I expected him to be the predominant face of the British troops, and thought I understood a great deal about the scenes that would unfold in this weeks episode. As has happened so often in this series, the episode contained some scenes directly from the book, and portions from the book shifted to other characters and other positions. I said last week that it was best to have read up through Chapter 21, and while I now realize that does cover into the next episode (The Wedding), I think some of those scenes have been merged and shifted into this week’s episode, and last week’s. For instance, one character from this week’s episode is at the very end of chapter 20 (Corporal Hawkins). Where the first episode of Outlander felt almost like an abridged presentation of the book, each episode since has felt less and less bound to the novel, and yet they have maintained the spirit and spark of the prose so well, that it can be difficult to fully recognize while you are watching the show which parts are created from scratch for the series, and where dialogue has been pulled from Dougal speaking to Claire beside the spring in Chapter 13 and given to Black Jack Randall in episode 6. Hard to believe, and yet, so well done that each scene plays well, conveys the same scene with great power, and presents two different perspectives on the same scene and gives Claire very important knowledge about the world she is now surviving in, and the people around her. This entry was posted in Novel, Review, Television and tagged Angus Mhor, Annette Badland, Bear McCreary, Caitriona Balfe, Claire Beauchamp, Claire Randall, Colum MacKenzie, Diana Gabaldon, Dougal MacKenzie, Duncan Lacroix, Fan Expo, Fan Expo Canada, Fan Expo Toronto, Frank Randall, Gary Lewis, Gathering, Geillis Duncan, Graham McTavish, Grant O'Rourke, Jack Randall, Jamie Fraser, John Heffernan, Laoghaire, Lotte Verbeek, Mrs. Fitzgibbons, Murtagh Fraser, Nell Hudson, Outlander, pocket Jamie, PopArtsPlace, Ron Moore, Ronald D. Moore, Rupert MacKenzie, Sam Heughan, STARZ, Stephen Walters, The Way Out, The Woman of Balnain, Tobias Menzies, Tom Brittney on September 16, 2014 by A Novel Approach. Rent, the fifth episode in the first season of Outlander on STARZ shoots the story ahead. The reviewers who saw multiple episodes of the show before it even aired and reported there was no action or intense drama have me wondering what show they watched. 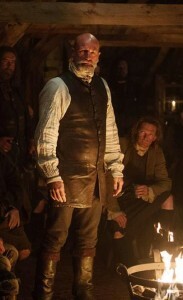 On her facebook page the day this episode aired Diana Gabaldon posted a picture of Graham McTavish, the actor who portrays Dougal with a note “All Dougal, All the time…”, and after watching the episode I can easily understand why — the plot gave him a thousand and one moments to shine, and he made the most of each and every one of them. For those reading as we watch, last week we ended at approximately page 200, or the beginning of Part III / Chapter 11, well, I hope you have a boring week ahead of you in the real world, because STARZ, Ron Moore et al, packed this episode full of great stuff, much of which was out of the book, and suddenly we are gearing up for some of the events at the beginning of chapter 21 next week! Set aside some time in a comfy chair and pull out your book, Chapter 21 starts on page 371 and that is the best approximation of where episode 5 left off and 6 will pick up. Always keep in mind scenes are shifting around slightly, situations are changing, and part of the fun of reading the book as well as watching the show is seeing what so captivated everyone that it simply could be no other way, and what this amazing collaborative team came together on as a force of nature and suddenly one woman’s vision has been enhanced, and changed and now on the screen in vivid color we have these walking talking characters. I try to find the chapter in the book that come closest to matching where the episode left off, knowing the book often contains subplots that could not make it to the screen, characters we seem to recall reading but not seeing, and so on. As has been happening with each episode, there are changes being made, and so many of them work so nicely, there were a few here that strengthened a lot of relationships, and the actors, one and all, worked beautifully with the material they were given. I love the looks they exchange, the nuances they have in their performances, the subtleties they are filling their roles with. Rupert and Angus, and the clansmen Claire and Jamie travel with as Dougal collects the rents feel like genuine people and characters, as opposed to extras who happen to be on the screen at the same time, and for that I give everyone a great deal of credit, as that is much easier to do in a book than in a television show. Scenes that in the book built up Jamie the one man Claire knew and trusted, were used in the show to flesh out the world, to build her understanding, to build the audience’s understanding of the people and the world, and to create a genuine quandary at the end of the episode so it ended on a question that could have been a simple yes or no but was, instead, a question that makes you want to tune in next week because Claire could answer it either way. As the screen faded to black she is clearly debating her answer, and with seemingly good reason, a different situation entirely than the end of chapter 20, and yet they both clearly set her up for the beginning of chapter 21. This episode is a prime example of why the actors, and the writers, deserve kudos and high marks for the fantastic job they are doing taking Outlander from the page to the screen. Highlight the space/text above with your cursor and it will magically appear… if you don’t mind a few details that should not qualify as storyline spoilers, but one never knows where others draw the lines, so I decided to err on the side of caution here, and conceal those details from the naked eye. This entry was posted in Novel, Review, Television and tagged Angus Mhor, Annette Badland, Bear McCreary, Caitriona Balfe, Claire Randall, Colum MacKenzie, Diana Gabaldon, Dougal MacKenzie, Duncan Lacroix, Fan Expo, Fan Expo Canada, Fan Expo Toronto, Frank Randall, Gary Lewis, Gathering, Geillis Duncan, Graham McTavish, Grant O'Rourke, Jack Randall, Jamie Fraser, Laoghaire, Lotte Verbeek, Mrs. Fitzgibbons, Murtagh Fraser, Nell Hudson, Outlander, pocket Jamie, PopArtsPlace, Ron Moore, Ronald D. Moore, Rupert MacKenzie, Sam Heughan, STARZ, Stephen Walters, The Way Out, The Woman of Balnain, Tobias Menzies on September 8, 2014 by A Novel Approach.